This collection of papers crafted by young Tartu scholars is filled with a variety of semiotic topics, ranging from specific issues to broader theoretical problems. As a whole, it acknowledges current semiotic thinking as not only a maintenance of the intellectual course of the Tartu school but actively pushing forward the idea of reality, plurality, and inevitability of general semiotic theory for today’s world. Many fresh and bold ideas presented in Concepts for Semiotics provide an illuminating glimpse into the future of semiotics. Accountability, anticipation, autocommunication, censorship, drawing, droodle, ground, innovation, landscape, library, literary history, metatext, minimal model, mytheme, normalization, ostension, self-description. These are the concepts treated in this collection of articles, opening a window into the developing trends within semiotics. 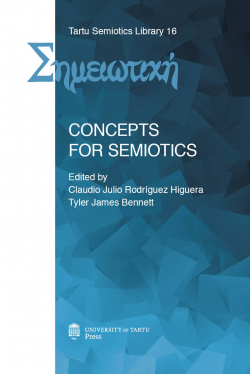 Concepts for Semiotics presents a number of research possibilities with such disparate topics as literature, education and biosemiotics, centered on the theoretical principles of the Tartu school of semiotics. The aim of this publication, organized by Kalevi Kull and Mihhail Lotman, is to present the evergrowing research perspectives of those engaged directly with semiotics as graduate students in Estonia. To define such a dynamic school of thought as Tartu semiotics is to capture an instant in time and forge a link in the long chain of communication between past and future.